Great night of music...the crowd was very in to the music that night. 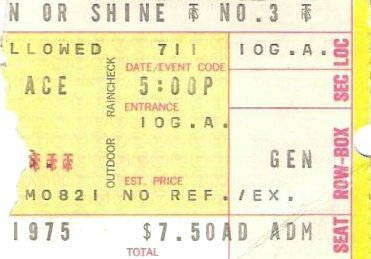 One of my first concerts, I think I knew how lucky I was to see them in their prime. It was general admission and we wound our way up to about 10 feet from the stage between Jon and Chris. 1975 was the beginning of a great time in world history. The world had entered into a new era. As a young college student I was awakening to the excitement that was foretold in the music of YES. The music of YES was extraordinary. Having played the Coliseum as a local musician, I was aware of the acoustical challenges of stereophonics in an arena designed for hockey games. Not only did YES pull it off, but they superceded my wildest expectations. As I listened to the extraordinary talent on stage, I envisioned a concert in California after the beginning of the New Millenium, when I would see the fruition of the words so articulately placed on the pages of composition. This fall I attended my second YES concert at the Universal Amphitheater, in the 2004 Nrth American tour, and saw that vision realized. At the Fort Wayne concert I recall the candle lighting ceremony. What the members of YES probably had no knowledge of was the depth of appreciation for their music in Indiana. Their music was already being studied in the high schools and colleges. The affection and appreciation could not be expressed by the candle lighting ceremony despite its beauty. At the California concert, I had the privilege of introducing my 16 year old son, an extraordinary guitartist, to the live performance of YES. He had always liked YES but was a fan of Dream Theater as well. (Actually, I love Dream Theater too.) By the end of the concert he was as stricken with awe as I was after the Fort Wayne concert. The best of it all is that both concerts were in small venues and we had the opportunity to enjoy the concert as if we were in our own living rooms. Alas, I left my musical career to become a lawyer. But I will always have a special place in my heart for these musicians who show so many of my generation the way to a New Millenium.